My first encounter with Gordon Jenkins was as a teenaged Harry Nilsson fan back in the '70s. Harry did something unheard of at the time, recording an album full of old standards like As Time Goes By and Makin' Whoopee, backed by a full orchestra. (Obviously, it's not unheard of now, but I don't think it's fair to blame Harry for Rod Stewart's indulgences.) The orchestra was conducted by Gordon Jenkins, who I later found out had an incredible career, working with Ella Fitzgerald, Frank Sinatra, Louis Armstrong, Judy Garland, and many others. He also collaborated with the Weavers, most famously on Leadbelly's Goodnight, Irene. Suffice it to say that over the years I have become suitably impressed by Gordon Jenkins. So, when I spotted an LP credited to him at a garage sale, I snapped it up. 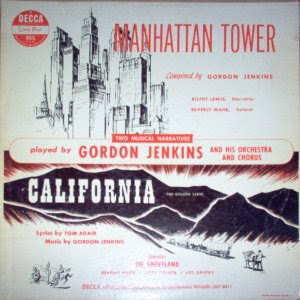 The album, pictured here, is Manhattan Tower and California: Two Musical Narratives (Decca DLP 8011). When I got around to listening to it as part of my vinyl digitization project, I found that the "musical narrative" form is something that reminds me a great deal of early Disney work -- musical motifs under a storyline narration, occasionally breaking into small choral or solo songs. About halfway through the first narrative, though, I heard something very familiar -- the song New York's My Home, one I have always known through Ray Charles' rendition. Initially, I thought Jenkins must have incorporated it into the narrative. A bit of research (all right, Googling) leads me to believe, instead, that Manhattan Tower is, in fact, the original source of this song. The album itself is dated 1949, and the hit version of the song, by Sammy Davis, Jr., did not come out until the 1950s. And the credited author of the song, on both Davis' and Charles' versions, is Gordon Jenkins. So, finding the original version of it was a nice treat. One side note: barring the discovery of some other forgotten, buried treasure, this album represents the oldest LP I own. As I mentioned, the copyright on this album is 1949, and according to Wikipedia, the LP was first introduced in 1948. Speaking of Judy Garland, please check out the popular new Yahoo group THE JUDY GARLAND EXPERIENCE. This weekend we are having a contest where you can win unreleased CD's by Judy, Sinatra, Streisand, Liza, Chita, Johnnie Ray, and Frances Faye. THE JUDY GARLAND EXPERIENCE has exceptional members, amazing audio files, great pictures, and lively discussions. You might want to do a web search and find the later and much longer version of Manhattan Tower--about 3 times as long, and just issued on CD. It's wonderful, and if you like the original, you should love this second version with another story added to it.